Gallery ~ Recherches pour servir a l'histoire naturelle des Mammiferes, Gerbillus unguiculatus, by A. Milne Edwards. Armand David was born on the 7th of September 1826 in the village of Espellette, France. He was the son of a doctor, who also happened to be the mayor in the town where he lived. His father was a keen naturalist, who taught his young son a great deal about plants and animals of the region where they lived, and he also taught him basic medicine. Throughout his early life this keen interest as a naturalist continued, and he also became an outstanding scholar at the schools he attended. In 1850 he took his religious vows and decided to become a missionary. During the next ten years of his life he taught science in Italy, and continued his keen interest in natural history by collecting specimens of plant and animal life of the region. In 1862 he was ordained as a missionary and was sent to Peking, China. Because he was already acquainted with several French naturalists, his mission was seen as an ideal opportunity to further study the animals, birds, plants and the geology of the region, and was requested to collect and return to Europe examples of the diverse fauna and flora while he was teaching there. His first posting lasted two years and he taught in a school in Peking. During the period he taught there he created a school museum that was filled with the many specimens he had collected. Meanwhile back in Europe, Henri Milne-Edwards who at the time was the director of the museum d'Histoire Naturelle persuaded a government department to fund him on more extensive expeditions, based on the importance and quality of the specimens that Armand had already sent back to Europe. The head of his order approved of this and released him from the school, which then allowed him to travel and explore this new region more fully. Between 1866 and 1874, Armande's journeys took him to the North and west parts of China where very few Europeans had travelled. During this period, his new discoveries of plant and animal life were quite considerable, and Europe gained a huge knowledge about these new regions in China. His journeys saw him help identify 63 new species of animals, 65 new species of birds, and many new fish, insect and reptile species. The same can be said for the many plant species he discovered there, which included 52 new species of Rhodedendron alone! Many of his plant discoveries are now decorating many gardens worldwide. These include Buddleia Davidi (Butterfly Bush), Prunus davidiana (The Davids Peach), and Lilium davidi (David's Lily). Today two animal species are synonymous with Armande David, these being Father David's deer (Elaphurus davidianus), which he discovered in the imperial parks as ornamental additions, but which were extinct in the wild. The other being the Giant Panda, (Ailuropoda melanoleuca) which although he did not actually see one, he did send skins of the animal back to Europe. However Europeans had to wait until 1914 before they actually saw a live specimen. For gerbil enthusiasts it was his journeys to Inner Mongolia that are of great interest. These began in 1866. Luckily for us, all his adventures and observations were meticulously recorded in his diary. Below are some translations from his diary, where he writes about his first sightings (the first of any European) of the Mongolian Gerbil, which at the time he referred to as 'The yellow rat'. April 23 Today the weather is excellent; we have left the high plateaus and it is very warm. Here the plain of Kweisui begins, crossed by a little river, which we have followed since morning. The plain is fertile and well cultivated and is scarred by some sandy places inhabited by great numbers of yellow rats with black claws, which gambol in front of their holes. Armand returned to Europe in 1874 and settled in Paris. In the 1880's he made a further two expeditions to North Africa and Turkey. He became quite a celebrity in scientific circles, and was frequently invited to talk at various symposiums and learned societies until his death in 1900. Below in the gallery is a copy of the original publication, which was kindly sent to the eGerbil website by Dr. Fred petrij. 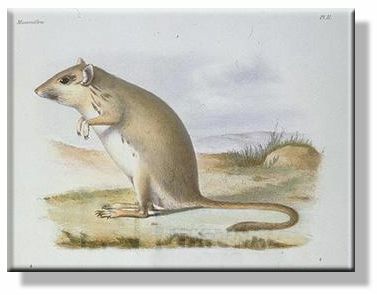 The publication is exceptionally rare, and marks the introduction of the Mongolian gerbil to the scientific community. In 1935 Professor Kasugo who had been studying the Mongolian gerbil in the wild, and subsequently imported a batch of twenty pairs into Japan. These gerbils were captured in the basin of the Amur river in Mongolia itself. These gerbils were sent to the Kitasato institute to be used primarily for Rickettsial studies. It is this first batch of gerbils that were originally captured around Eastern Mongolia and Manchuria that are the probable foundation ancestors of most of the gerbils that we now keep today as pets. In the U.S.A news had reached Victor Schwentker about the Japanese research programmes into the Mongolian Gerbil, and after some initial correspondence with them he had 4 pairs imported in 1954. This particular batch which Dr.Schwentker obtained came from Miss Michiko Nomura (Central Laboratories for Experimental Animals) who obtained her stock from the Kirasato Institute in 1949. Dr. Schwentker established the first commercial colony of Mongolian Gerbils at the Tumblebrook Farm. At Tumblebrook farm work was then started to increase the numbers of Mongolian gerbils, and eventually five of the initial females produced young. It was during this period that they discovered just how friendly and suitable a pet the Mongolian gerbil was. So when sufficient numbers had been reached, some of the surplus offspring were then given to families and friends to keep as pets. It wasn't long after this that they were then seen in pet shops. In 1964 the first gerbils were imported into the U.K. from U.S.A. stock. A short time after in 1966 they arrived in Fylde, near Blackpool, which is close to the area in which I live in the Northwest of the U.K. These two initial gerbil populations from the U.S.A and UK have continued to breed well despite the small number of foundation pairs, and have since been exported to many other countries around the world. Today gerbils continue to fascinate young and old alike with their incurably cheeky and curious natures. New coat mutations arise in this every day, non-endangered, domestic species quite rarely, but when they do appear, the new coat types that result from crossing the mutations to existing coat colours continue to fascinate many gerbil keepers, present, past and those yet to come into the hobby. MONGOLIAN GERBILS - Richard O'Grady, Director of Glasgow Zoopark.